Am I back to the busy schedule that I don't even have time to breathe? Yes, my life is once again chaotic. I miss the holidays (never thought I'd say this since I'm such a Grinch). However, this was a good week for me. I can't recall the last time I read so much in a week (Bout of Books 21 surely helped). 🌻 I joined Bout of Books 21 and thanks to it I already read four books this year (A Darker Shade of Magic, This Savage Song, In Frankenstein's Shadow - for my dissertation - and Always and Forever, Lara Jean). I believe this is a new record for me. 🌻 I WON A GIVEAWAY! 😀 Last Wednesday, Funko Europe hosted some flash giveaways on twitter and I won one of them. You know how addicted I'm to funkos. 🌻 My first popular Young Adult book ARC request was accepted! *happy dance* Ps. It isn't the first ARC I receive. It's the first "mainstream" ARC that I receive. Mainstream as one of those books that is so popular that you never though you would have a chance to get your hands on before its release. Although I updated my blog every single day, there was only one post this week, my Bout of Books progress. In case you've joined the read-a-thon, let me know so that I can visit you blog and take a look at your progress and challenges. Two weeks since 2018 began, two weeks without spending a dime on books. I'm not sure for how much longer I'll resist, but so far my bank account is safe. Nevertheless, this week I received from Netgalley To Kill a Kingdom by Alexandra Christo. SO EXCITED! I love retellings and this one has been on my list of 2018-releases-I-can't-wait-to-get-my-hands-on for a really long time. It was such a good surprise. I was really not expecting my request to be approved, but it was. How was your week? Which books arrived to your bookshelf? Yeah for your Twitter win. I love winning things. It makes me feel like the universe is on my side. You read some great books this week. I was happy with Always and Forever, Lara Jean. I would have loved an epilogue or the promise of a Kitty spinoff, because I really want to know how it all worked out, but I did feel like Han brought her full circle and we know what all the major players are up to. I did enjoy Always and Forever, Lara Jean - I felt so happy when Jenny Han announced it. If a new book were to happen (a Kitty spinoff), Lara Jean and Peter had to be together. My hear would never survive to their break up. Congratulations on your ARC acceptance! Those get me screeching like a little girl too XD. What giveaway did you win? Was it gift cards or books? Thank you Anne. :) I won a Funko giveaway on twitter. Lots of Funko merch coming my way now. Congratulations on your first YA ARC acceptance! I remember when my first ARC arrived in the mail; I was so excited that I couldn't breathe! The 15 year old me was so jittery! It only gets better from here. Hope you enjoy reading To Kill A Kingdom! Thank you. Actually, it wasn't my first ARC acceptance. I've been accepted before. However, it was the first time that my request for a popular book was accepted. Receiving ARCs (and free books) is always so exciting! Congrats on receiving your first ARC! I hope you enjoy it. Love your blog and I look forward to following to see your regular posts! Yay for getting books read and for being successful in bout of books! Enjoy your week and your new ARC! I love doing the Bout of Books challenge! I actually gotten pretty far in the Martian by Andy Weir because of it! Congratulations on the ARC and the win. Have a great week! Wins are so much fun! Enjoy your new books! Congrats on the ARC and giveaway win!! That's so amazing, I'm so happy for you. Sorry you've been so busy :( I hope this week is a bit better. I'm starting school next week and I'm so dreading it! Let's hope so - weeks shouldn't always be busy. People need time to relax (there is no good in always being stressed). Good luck going back to school. I hope all goes well. By the time I remembered Bout of Books was happening, it was too late to join in. January is always so busy for me anyway. Congrats on the win and the ARC. Enjoy! I hope you've a chance to join the next Bout of Books (I think it's in May). I love this read-a-thon because it helps me to go through my TBR pile. Congrats on the giveaway win and on reading four books already. Thank you Lindsey. 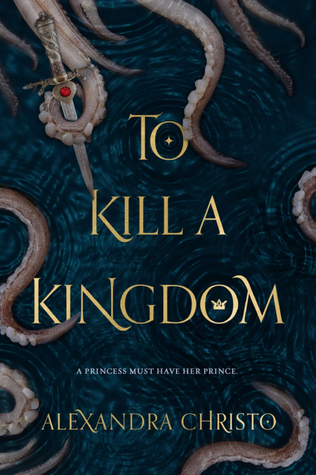 To Kill a Kingdom is one of my most anticipated reads of the year too, so I couldn't be more excited when my request was accepted. Congratulations on the win, the reading and on the ARC acceptance. Happy Reading! Congratulations on getting your ARC! Lovely feeling, isn't it?! You've already read 4 books this year? WOW you have been busy! I'm reading To Kill a Kingdom soon too, I hope we both love it.